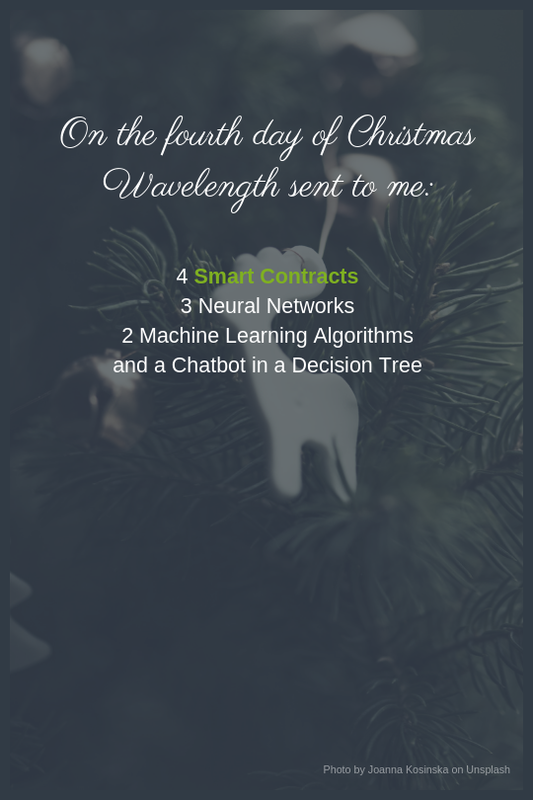 We hope you enjoy Wavelength’s festive introduction to some of the key concepts of Legal Engineering & Tech (singing along with gusto in your open plan office or on the tube/subway is heartily encouraged!). Wishing you all a healthy and prosperous 2019. A set of instructions detailing a repeatable process. Any approach used by a computer to solve a problem or reach a goal is defined in an algorithm. One or more algorithms capable of performing complex tasks perceived to require human level intelligence. Examples include visual and speech perception, complex decision-making (e.g. playing chess), and language translation. “Narrow” or “weak” AI refers to an AI of limited capability focused on a specific task. Narrow AI is integrated into many modern everyday applications. “General” or “strong” AI refers to an AI that can learn and perform a broad set of tasks independently, closely resembling a human. This type of AI currently exists only in works of science fiction. The creation and implementation of an algorithm to perform a repetitive task with minimal supervision (in many cases previously done by a human). Automation is generally applied to increase accuracy and productivity, freeing up humans to do more complex and meaningful tasks that require competencies such as emotional intelligence, critical reasoning and creativity. Short for “robot”, is an algorithm designed to operate autonomously in a specific environment. A bot that allows users to interact with a computer in a way that mimics natural conversation in a text chat or over the telephone. Data that is too large to process using traditional database infrastructure. The scale of information contained within Big Data allows otherwise concealed insights to be revealed through the use of modern analysis techniques, such as machine learning. A digital, decentralised ledger that logs events such as transactions in chronological order and is shared between participants (a.k.a. nodes). Each participant independently keeps an identical copy of the ledger that gets periodically updated with a batch of new event logs (a block). A blockchain can either be permissionless (with no barrier to entry to use it) or permissioned (only people with access rights can participate in the blockchain). See also Distributed Ledger Technology. 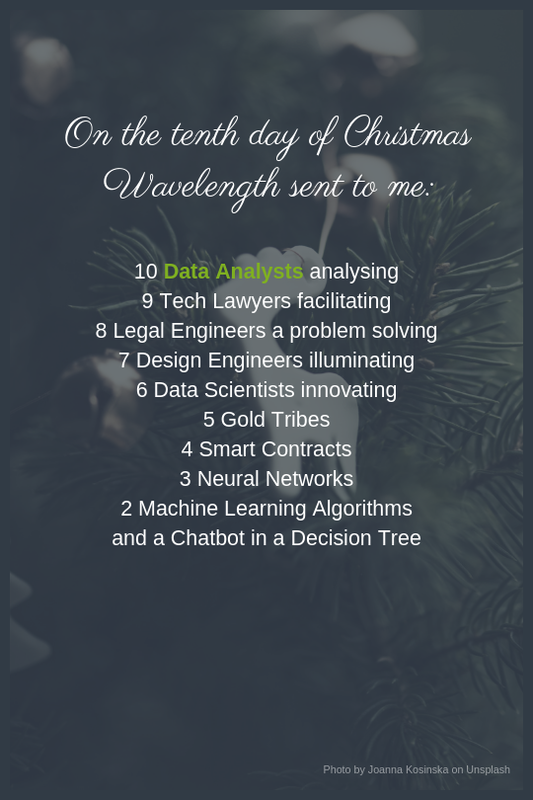 The Wavelength capability model of legal innovation technologies, which maps out the current range of legal AI, automation and productivity tools and how they can be applied to optimise delivery of legal work. The process of designing and building a software algorithm (“writing code”). The representation of information in physical/digital form. Structured data is information that is highly ordered, typically tabular and can be easily indexed by a computer. Semi-structured data may not necessarily fit in tabular form; however, it does have has an organised high-level structure. Unstructured data – 'everything else' – refers to data that does not have any standard structure and cannot easily be decoded by a computer. A facility (software or hardware) that enables and governs the storage of data, generally in electronic form. Most databases are purposefully structured in a way that makes it easy to retrieve information. A cross-disciplinary professional who leverages their skills in mathematics, computer science and specific domain knowledge to analyse and gain insight from data using tools such as statistical analysis, machine learning and artificial intelligence. Maps all possible outcomes of a multi-decision process given a certain input. Each decision is represented by a node that branches off into other decision nodes. The typical appearance of such systems resembles a tree as there is one input and many outcome possibilities. The route taken is determined by the decision at each node until the user has reached an outcome. A type of machine learning algorithm that uses a complex neural network and requires large amounts of training data, for example images, text and audio. Deep learning algorithms are the fundamental components of applications such as digital assistants, self-driving vehicles and medical diagnostic applications. In the context of the legal sector, is automation applied to the practices of document creation, processing and analysis. See also “Automation (including Robotic Process Automation)”. An approach to book-keeping type processes where there is no central source of validated information, thereby eliminating the need to trust that single source. The validated information is distributed across a network of participants, each participant having an identical copy of the up-to-date ledger. See also “Blockchain”. Refers to the use of electronic tools such as machine learning algorithms to find, collect and process information and/or documents that can be used as evidence in legal proceedings. A type of algorithm that conveys knowledge on a certain topic essentially replicating the advice of a subject expert. Expert systems are typically expressed in the form of a decision tree, which in most cases need to be manually programmed and are thus costly to set up and maintain within a dynamically changing environment. A person who applies design thinking to the area of law; focusing on the “users” of the law to develop legal products, services and processes that are easier to understand and more accessible for people. A Legal Design Engineer also integrates the smart use of data and technology to augment designed legal solutions. A person that sits at the interface of technology, law and data, and who is trained and skilled in the construction of designed legal solutions. In a nutshell – someone who rolls their sleeves up to design and build legal solutions at the interface of tech, data and law. An area of AI that deals with algorithms that “learn by example”. Machine learning is the technology underlying most natural language processing algorithms and the two terms are often treated as equivalent in the context of legal technology. This method is a lot more efficient at dealing with unstructured data such as images and text than a traditional rules-based approach. Data that describes or provides information or context about other data. Metadata can be created manually or by automated information processing. An example of metadata could be the name, date, abstract or author of a document. A type of AI that deals with understanding and processing human language. It is widely used in legal technology applications, for example to categorise clauses or documents. Natural language processing algorithms are usually based on machine learning techniques. Here meaning an artificial neural network, is a machine learning algorithm (software or hardware) inspired by and resembling the networked structure in a biological brain. 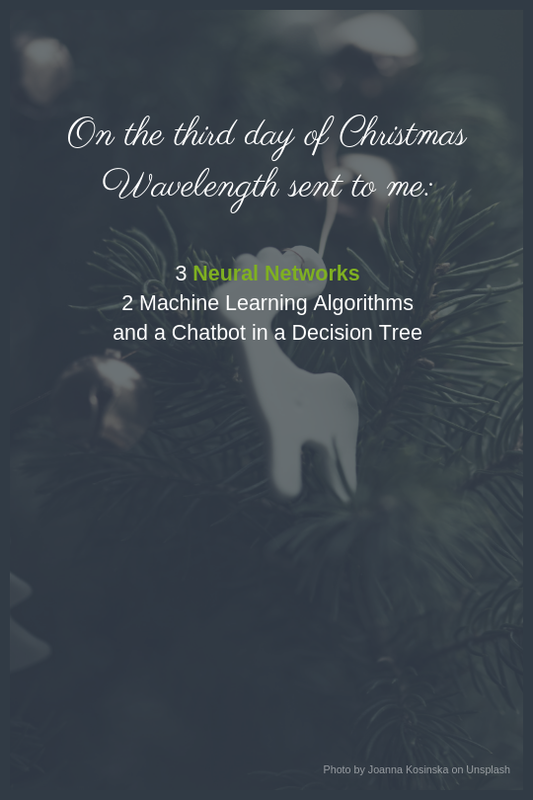 Artificial neural networks are used to solve statistically complex problems such as pattern recognition in images and sounds as well as text and analysing human language. It is widely used in legal technology applications, for example to categorise clauses or documents. Natural language processing algorithms are usually based on machine learning techniques. A type of algorithm used for extracting text from an image (e.g. a scanned document). A contract that is translated into a set of pre-programmed conditional statements (equivalent to contract clauses) that execute automatically when certain conditions are met, e.g. transfer cryptocurrency funds. Smart contracts usually rely on one or more blockchains, or other DLTs, to record any executed transactions and/or other events. A process of using technology to enhance document review capabilities in the context of an eDiscovery process. Symbolists deriving from logic and philosophy. For some in the machine learning world, the ultimate goal is to use the five Tribes to create a single ‘Master’ algorithm capable of learning anything. About the authors: Claire Walden is an experienced commercial contract and property lawyer who applies her extensive legal experience to legal technology applications. Dmitriy Podkopaev leverages machine learning and artificial intelligence to find new ways of processing legal data to extract deeper insights. Thanks for reading, we’d like to hear your thoughts – get in touch or subscribe to our blog to be the first to receive all of our latest content.